Upgrade your everyday wardrobe with this Casio Classic men's digital watch. 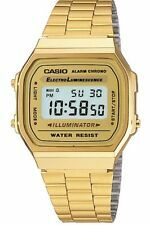 This Casio Classic features a square face with a gloss finish and a digital display. Featuring a stainless steel band, it will easily match your unique style. It has a built-in alarm to ensure that you're always on time. Made with a water-resistant design, this model is ideal for your next beach vacation. Complete your favorite look with this Casio Classic watch. SE Hn5 Watch Case Back Opener 3"
High quality watch, has calendar, alarm and timer, retro design incrive. For you who are stylish and who want an even more sophisticated look in the look, the tip is to invest in accessories that illustrate your whole personality, such as this Casio Watch. Produced with materials of high standard, it gathers good taste and quality in a perfect harmony, besides having innovative design. A precise accessory and perfect for your day to day. Great Casio watch. I wear it every day. Keeps time very well and also time setting is very straightforward. Very good quality for the money. Displaying the month could be easier (mode mode mode light light light), but it's rarely needed anyways. I highly recommend this watch if you like digital watches.